The school are striving to achieve a physically educated and physically active school community. With help from our teachers, students, parents and wider community we hope that in 2017 our school will be recognised as an official ‘Active School’. As always, when the school community puts our collective minds to something we can achieve big things. This will be no different. So with everyone’s help, ideas and support, we expect to be flying the Active School Flag with pride at the end of this school year. To become an Active School, we will need to focus on 5 key areas. Energise the school day and the school year: we will be including ideas such as DEAR and DEAD (Drop Everything And Run / Drop Everything And Dance), an Active School Week built around our traditional sports day, rainy day lunch activities and plenty of extra-curricular physical activities to boost the energy levels of our students. Create stimulating playgrounds: you may already have noticed the changes made in the school playgrounds? If not, take a look on the ground next time you are in Corville. We are striving to make our playgrounds positive, fun, inspiring environments for all. Introduce variety: One size doesn’t fit all! We want to introduce children to as many different activities as possible. We invite the local community, sports clubs, physical activity facilitators to visit our school to give ‘taster’ training sessions to our students. Inclusivity: At all times we must ensure that all children can participate in these activities. We will need to focus on the children that are less active and try to find things that will interest them. Lastly we will aim to show the children that adults enjoy physical activity also by organising whole school activities involving teachers, parents and students. Make it fun! We want this project to be a positive and fun experience for all. 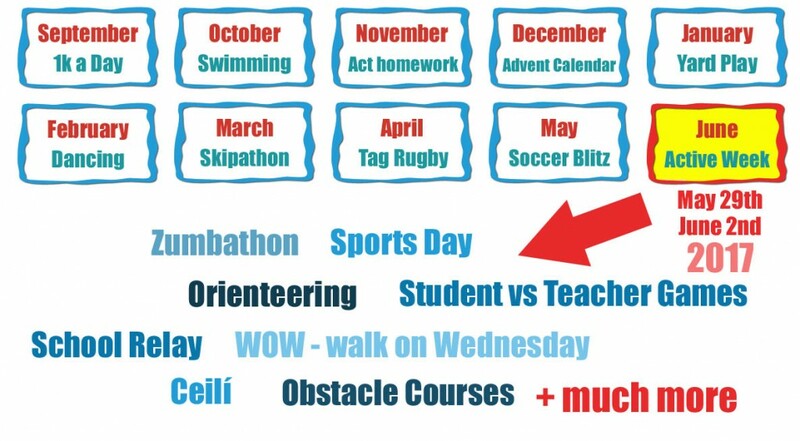 Each month, the whole school will engage in a different physical activity. The plan for the 2016 / 2017 school year is below. As you can see, there is a wide variety of activities for the children to get involved with. It all culminates with our Active School Week in June. For Corville to become an active school – we really do need your help. So please volunteer your time to help us achieve this goal. If people in the community have ideas, can lend a helping hand or want to join our active schools committee then get in contact with the school. The teachers leading this school project are listed below. To keep up to date with all things ‘Active’ in the school, we have created a Facebook page. Make sure to visit and like this page. We have loads of photos and reports for you to view.